Currently we offer five varieties of trees that you can cut yourself. They are Scotch Pine, Blue Spruce, Douglas Fir, Canaan Fir, and Concolor Fir. We also have a large selection of pre cut Fraser Fir trees. 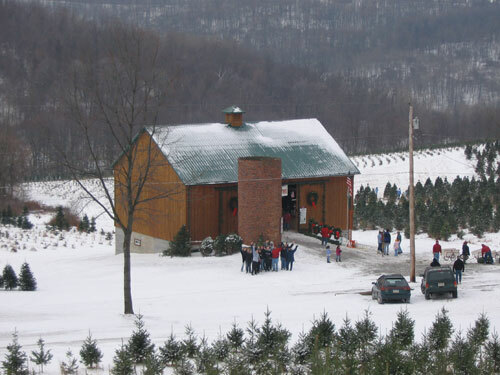 Voted best tree farm by Pittsburgh Magazine, you and your family will have a wonderful experience searching for that perfect tree, sipping hot cocoa, and finding that special handmade ornament in the Christmas store. Tree tied down for you, Enjoy! Cash or Check Only. Please no pets. Thank you. Really enjoyed our first visit here...will certainly be back next year! - Lauren F.
If you live near the Burgh this is the place to go!! We go every year. - Jessica J. Great place to get your Christmas tree! The only problem is deciding on which tree to get. They're all so beautiful!! - Pam S.
The best place EVER to find a Christmas tree! It's been a great family tradition for us for years. Can't wait to go AGAIN this year!!! MERRY CHRISTMAS!! - Al M.